51 minutes, 14 seconds. 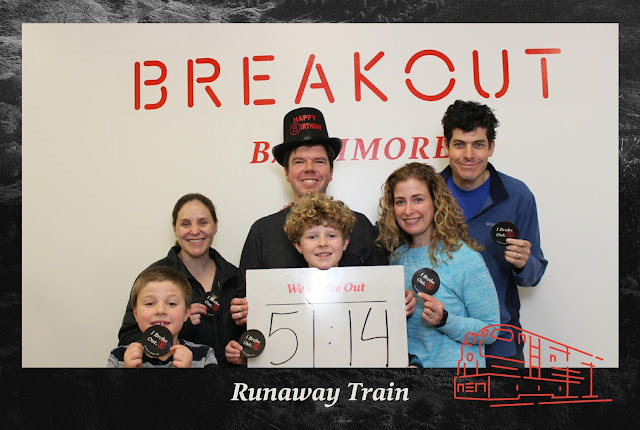 That's how long it took for the 6 of us to bust out of the Runaway Train room at the Columbia Maryland, Breakout Escape Room. This is Shira and my second Escape Room, the first one being a Sherlock Holmes themed room in Alexandria, Virginia. 1. Ask for hints. In our first escape room, we got the impression that we should be able to solve the room without any assistance. That was silly, as we had only a basic understanding of what we were trying to accomplish. For our second room, we had a much clearer idea as to how to solve problems, but were smart enough to ask for hints to keep the whole show moving. Our game master was top notch because regardless of the hint we asked for, she gave us just enough information to move forward. 2. There was a surprising consistency between our two escape rooms. While the two Escape Rooms we participated in were different genres and were hosted by different companies many of the same puzzles and tactics were employed. Not to mention, the level of difficulty was about the same: each challenge must be non-trivial, yet it does no good to over-think them. In short, the code for the lock isn't going to be 1-2-3-4, yet, it's not going to require you to use employ calculus. Because the rooms are solved using similar strategy, I get the sense that it would be smart to do a few more rooms with hints and *then* attempt one without assistance. Ultimately, it's about building up a library of puzzle types you can refer back to, and sharpen your observation skills. The kids did great in the room, and there were some challenges that they could absolutely participate in. Yet, there were some hurried moments when the adults were busy trying to decode something and the kids were left twiddling their thumbs--not fun. Still, it was great to share the experience with the kids and I'm glad they put up with the down time. Escape Rooms are clearly a fad of the moment. But that doesn't make them a bad thing. Go, give one (or two, or three) a try. Just make sure you bring the right people along, like we did last night, and you, too will escape!